For many of us, the academic year has come or is coming to a close and with that the busyness of wrapping up meetings, grading, and making difficult decisions. Yet amidst this organised chaos, uniting a course’s team of teachers for professional development and curriculum debrief best happens here while the year is fresh in our minds. This, however, can be challenging at this draining time of year. So how does a team leader create space for agency in these two areas without crossing into chore-like territory? 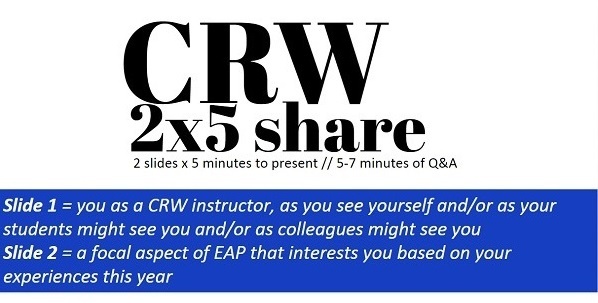 I lead a team of ten teachers in our 24-week Critical Reading & Writing (CRW) EAP course. Yes, a long program by many standards, but its intensity persists, leaving everyone a bit mentally fatigued. As lead, I wanted to create team activities on one day that would provide opportunity to reflect on teacher identities, but also space for constructive feedback and ownership over decisions for next year’s curriculum. With ten individuals, however, such activities could drag on and on, losing impact as the day goes on. How do we do this? How do we reflect on who we are, inspire those on our team, and still keep it reasonably short? After thought, I determined two modes of progression, which after the day ended, appeared to bear fruit. How I see myself = I like to think of myself as a “benevolent” leader, who fosters a sharing space for teachers, but also provides suggestions. How my colleagues may see me = While I am a teacher in the course too, as leader of the team and assistant director of the department, I imagine that teachers view me as a colleague, but not quite the same way as they view each other as colleagues (they’re Garth in this hippie commune – see slide). How my students may see me = Overall I hope to be seen as knowledgeable and helpful regarding content, but when it comes to assignments, I’m the gatekeeper to good grades. Perhaps this can’t be helped, but I’m sure I can work on approachability more. As far as areas of specialisation, it goes without saying that I’m interested in how academic reading circles plays out for everyone involved. Next year, I’ll explore further ways to integrate online tools to enhance their efficacy, particularly with group collaboration. I’d also like to record teachers demonstrated an ARC discussion together, and finally conduct a bit of formalised research on how students respond to ARC. During the Q&A, teachers talked about their experiences with ARC, suggestions of online tools worth investigating, and expressed some hesitant enthusiasm about how a recorded demo of us doing an ARC would help future teachers and students. Not too much came from my first slide, but that wasn’t the case going forward with the next teacher talks. Differences in how we approached the use of two slides emerged through the talks. This teacher used Slide 1 to put an year-end email received from a more problematic student during the year. What she described, however, focused largely on the perceived strictness of her classes. This led to an engaging Q&A about not only her desire to lighten up her in-class persona, but also the reasons behind focusing on this perception over the gratitude the student expressed. In Slide 2 was her interest in L1 use in the classroom, how we deal with it at different times and different ways, and how some research has led to reconsidering ways on which it can be capitalised. Other instructors used images as a starting point for discussion. For Slide 1, this teacher used an image of a sushi box to represent that she felt value in her cultural background as an immigrant to Canada with felt one foot inside and outside Canadian culture. What was brought up in the Q&A was how not having grown up in Canada helped her students to relate to her experiences (and vice versa), especially when one of our assignments focused on research about Toronto. She lived through the assignment process more closely to her students than others might have. In Slide 2, her images portrayed how she felt she was a tool for her students, but that she also wanted to explore further the role of teacher in EAP classrooms. While it was enlightening to see how teachers see themselves, it was the response in the Q&A that engaged all of us into how these perceptions connected to or varied from our own and the potential implications on our practice. With Slide 2s, I hope the seeds of potential research and expertising have been planted where each of us can contribute to curriculum discussion from a concrete angle next year. Maximising the individual talents and expertises within a team of teachers is always the goal and perhaps this is a further step in that direction. At the same time, I hope it gives a little direction to those who want it. It’s important for everyone to have agency in the material they teach, whether as materials creation itself or input into the lessons and assignments before they’re made. As part of the year-end course unit debrief, it’s valuable to get feedback from everyone about what worked, what didn’t, or other suggestions for next year’s curriculum. But this isn’t an efficient process if everyone meets altogether for several hours since discussion can be easily derailed on a particular (insignificant) point. Also, with too many cooks comes too many points to record accurately. 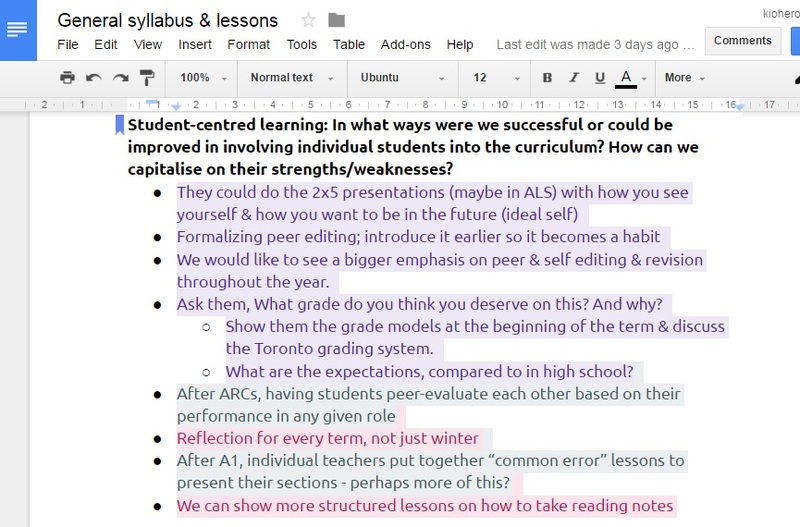 Instead, I created a shared Google doc for curricular areas of note, like particular assignments, individual lessons or materials, and any general team/course matters (see above graphic for one example). Rather than everyone giving their thoughts at once, we divided into five pairs, sat in five different areas, and focused on one topic. During that time, we discussed a few guiding questions on the doc to initiate discussion and with our laptops in hand, recorded our thoughts. After 10-15 minutes, we rotated, half clock-wise and half counter-clockwise, to different areas, where we had the same discussion but with a different colleague and different topic. After five rounds, this left me with an extensive topical commentary that I can use as a basis for curriculum revision next year (each colour was written by a different teacher during these meetings, see above). It also builds accountability for my planning, in that I can highlight areas I’ve incorporated or not on the document itself for everyone to see. This alleviates some discussion next September about what changes have been made and visually emphasises the importance of team suggestions. All in all, this day lasted from 10:30 – 3:00PM with an hour break for lunch–pretty manageable and highly effective. There are likely areas to tighten if I do this again next year, but it ticked all the boxes I aimed to tick and felt meaningful. Perhaps one of these areas might give others in similar contexts ideas for their year-end debriefs. Benjamin Stewart and I had a conversation about some of the aspects of this activity using Blab. The video of it is below. Tyson, your course sounds interesting – would certainly like to know more. How much was the course open or closed, for example? Was the course held online? If so, what ICTs were used? Would enjoy discussing this with you in an open space sometime, say in Blab or Hangout. I will be finishing up a CLIL course in June, and am thinking about what to do for next semester to make it a bit more open. Thanks for sharing this.